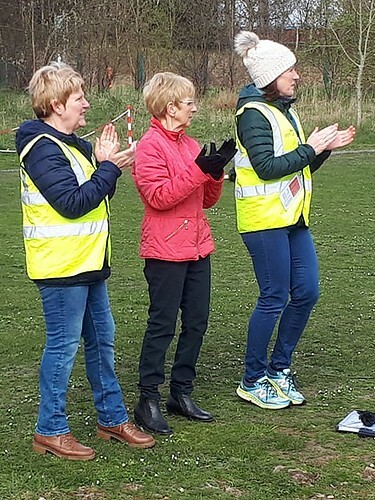 This week saw 220 of you completing parkrun, Roger was at the helm ably supported by Hannah Sharpe who is getting to grips with the RD role, and also by supported by another 29 lovely volunteers. This week saw Keith greet all the first timers, Keith was having a week away from timekeeping duty and even managed to get a run in. We are always on the lookout for volunteers, so please consider helping out if you don’t fancy running Please email us at PoolsbrookHelpers@parkrun or via the facebook page if you can help. If you are considering helping but are uncertain about what is involved then have a chat with us, all the roles are straightforward and we will give you full training. Many of our volunteers comment about it being a rewarding experience. 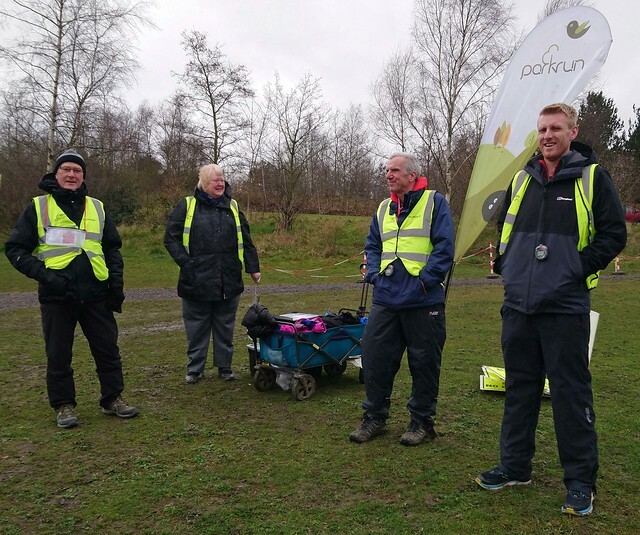 There are other volunteer roles where you can also run, you could consider helping with set up, tail walking, VI guide or why not try your hand at putting a run report together. See us on any Saturday and get your name on the board to help. As you can see we are a little short over the next couple of weeks. • Connor DRAPER achieved his 10th run in the junior category, 9 of these being at Poolsbrook. Connor has also run 9 junior parkruns with our friends at Staveley junior parkrun. 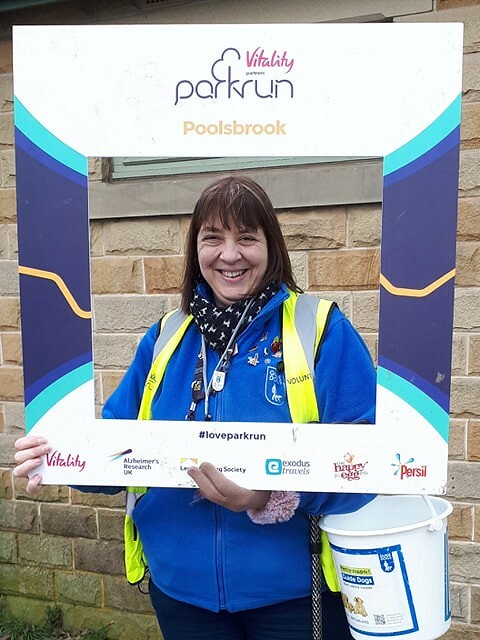 • Julie ATKINSON achieved her 50th parkrun, 19 of these have been at Poolsbrook. 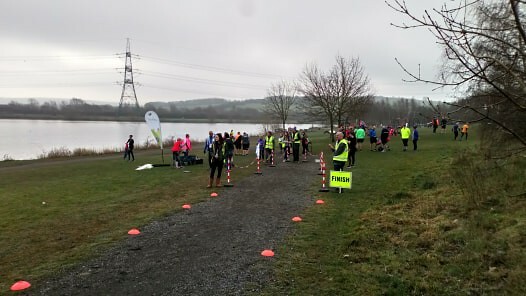 • John SANDERSON of North Derbyshire Running Club achieved his 50th parkrun ,22 of these being at Poolsbrook. 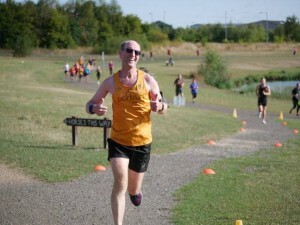 • David NAISBITT of Steel City Striders RB also ran his 200th parkrun and achieved a PM to boot. Layla DAVIES, Andy NORTON, Ryan AYLING, Charlie BROWN, Marie JENKINSON, Lorraine LOVE, Julie BIRCH, Anne BATTY, Lewis BATTY, Gemma HOBSON, Stephanie GROVES, Russell CUNLIFFE, Stephen CAVELL, Diana BOOTH, Joy NOBLE, Sue MASON, Stephen DAVIES, Ian CULLINGTON, Helen PARRY, Ian PARRY, Clare BINGHAM, Martin BROWN, Lucy CURTIS, Jason GREAVES, Karen READ, Stuart NESBIT, Alice ROBERTS, Imelda COLE, Jez CRITCHLOW, Simon HARRISON, Nigel CALLAHAN, Lucy HAMES, Nicola WOOD, David BARKER, Helena GODLEY, Simon TOMLINSON, Gemma MORRIS, Freya LOWE, Melanie BAKER-HUNT, Laura STANLEY, Ian ATKINSON, Helen WARD-WILLIAMS, Andrew PAGE, Robert BROWN, Scott CLARK, Ian RICHARDSON, Nick BURNS, David NAISBITT. It was certainly a fast one with 5 folk finishing in under 20 minutes. Have you had a chance to view the photographs that were take on Saturday, if you haven’t then you should pop onto our FB page and give them a view. Well done Lauren Hamshaw, you have a good eye indeed. Sadly one of our finish tokens (65) has made a bid for freedom and has left the flock. The other tokens (and core team) are sad and would like to see it returned. If you do find token 65, or indeed any other token when you get home then don’t forget we have an ongoing amnesty where you can return them at any time with no questions asked. As a thank you we will offer you a free parkrun for the Saturday of your choice.  Seriously it is a pesky business when they are lost and an expense we can do without, returning them is a great help. • Grassmoor 10k – Sunday 2nd June. • Elmton Chase (5) – Wednesday 26th June. 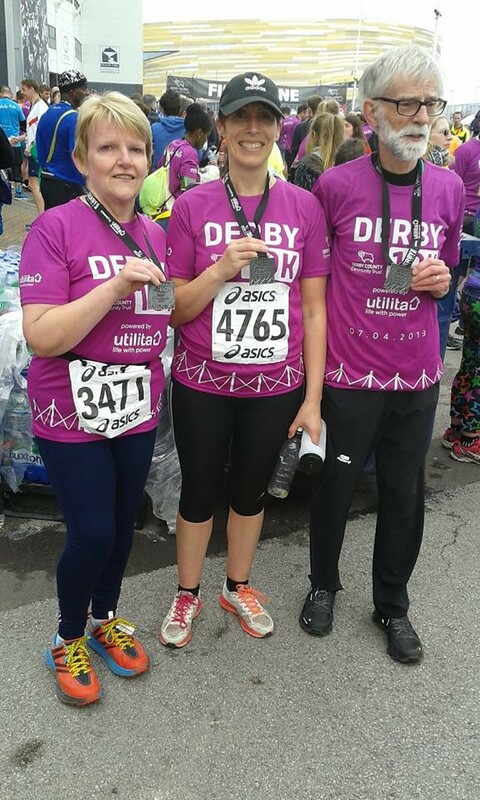 • Hardwick Hall 10k – Thursday 18th July. Regarding Barcodes, unfortunately we had 8 folk who did not have their barcodes this week. As you will know we are a barcode only event, you are of course welcome if you don’t have your barcode, but you will not get your time recorded, nor a credit towards the parkrun milestone t-shirt. We are not able to take barcodes off your phone under any circumstances, we need your physical barcode please. 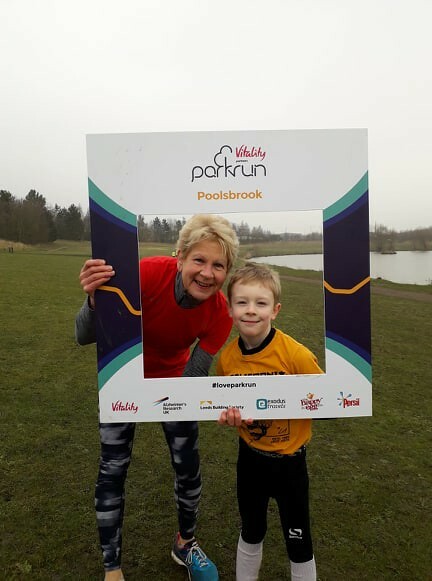 1.Ensure that you are registered with parkrun before you take part – follow this link for more information – don’t forget to select Poolsbrook as your home event. 2.Print out your barcodes and take several of them to each event. Keep one on you (ideally in a waterproof pouch or laminated), keep one in your wallet/purse, one in the car, and any others that you have pack them away in other items of clothing that you may take with you to parkrun. Next week see’s Roger (breaker of stop watches) doing a double shift and taking the helm again. Come along, it’s going to be a great morning. Although whilst we are quick to point out the danger to stop watches when Roger is around, you can see from the below that Andy was having a frustrating time with this pesky one, luckily it survived another parkrun day. Also don’t forget that our friends at Staveley junior parkrun are up and running at 9AM every Sunday for kids aged between 4 and 14. You can find out more on their Facebook page. A great event to bring the little ones so that they can get to enjoy parkrun. So, it was our 3rd birthday and what a great way to celebrate with friends and family. We asked for superhero costumes and we got them, lots of them, and they were just fantastic. We also had pacers, and not surprisingly these helped towards a fantastic 68 personal bests, well done everybody. On 2nd April 2016, 195 people turned up for our inaugural event. Numbers soon settled down to an average of 134 participants per week. So, 3 years later it’s great to see that we are now averaging around 213 per week and this is growing. This week we had 258 people take part supported by 25 volunteers. Many thanks to all of our wonderful volunteers who help out every week, come rain or shine. This week we thank Andy MORRIS • Andy PORTWOOD • Chris PATTISON • Claire BRACEGIRDLE • Emily BAGSHAW • Fiona GIBSON • Gabbie PATTISON • Gemma MORRIS • Graham WALTON • Halle WIGNELL-BOOT • Hannah SHARPE • Heather HILL • James SILVESTER • Jane GARDINER • Jean BAKER • Katie WALTON • Keith HUDSON • Mark HAZLEHURST • Paul CLARK • Steve TURNER • Suzanne LEUSBY • Teresa PAYNE • Wendy WESTON • William STREET • Zaheer MAHMOOD. We had a volunteer milestone this week, Gabbie Pattison volunteered for the 25th time, thank you Gabbie for all of your support. If you want to volunteer then please email us at Poolsbrook@parkrun.com or via the facebook page if you can help. If you are considering helping but are uncertain about what is involved then have a chat with us, all the roles are straightforward and we will give you full training. Many of our volunteers comment about it being a rewarding experience. 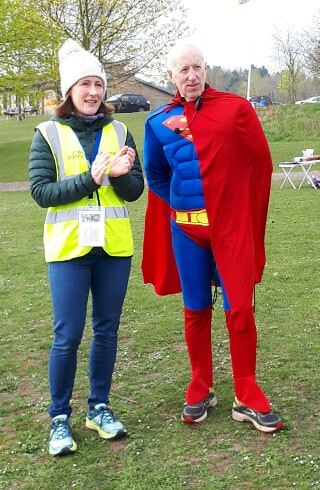 Mark was our Run Director this week dressed as Superman, and indeed he is a bit of a parkrun Superman as he has taken part 240 times (31 at Poolsbrook) and volunteered on 195 separate occasions (81 at Poolsbrook). Mark started his run briefing by thanking his fellow ED (Andy) and RDs (Chris P, Roger, Zaheer, Mike and Chris T) as well as all of the people who have volunteered at Poolsbrook in the past. Celebrating with us this week were milestone achievers Wendy Cotterill and Paul Taylor on 50 runs, Lauren Davies-Beckett and Lenka Sochor on 100 runs. Congratulations to all four of you, we are looking forward to seeing the red 50 shirts and the black 100 shirts very soon. As a reminder, if you have a milestone coming up, please let us know so that we can give you a ‘shout out’, please don’t be shy. Mark also welcomed this week’s first time parkrunners who we hope to see again very soon. Welcome to Ben MCHUGH, Ethan THOMPSON, Julie BIRCH, Leslie CROWE, Lisa DAVIES, Lorraine LOVE, Marie JENKINSON, Matthew THORP, Rachelle CANNON, Rebecca CROWE, Rebecca HOWARD, Sandra HOLMES, Tim CANNON. 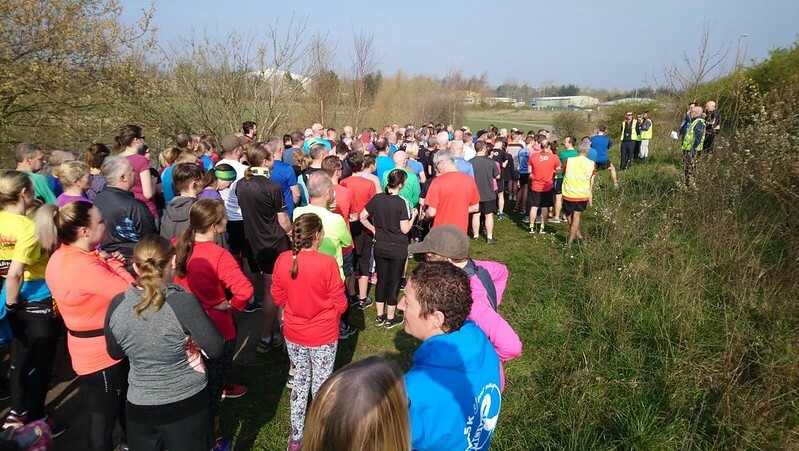 The weather behaved reasonably well, resulting in 38 personal best times, well done to everyone who managed their quickest Poolsbrook parkrun time this week. This week, for some unknown reason a number of participants fell over during the event, a few of them in one part of the course which doesn’t usually see too many people falling. All were trips, where the runner stumbled over something – we don’t really know what as the surface seemed to be fine (we spent some time examining it afterwards and could find no obvious cause). 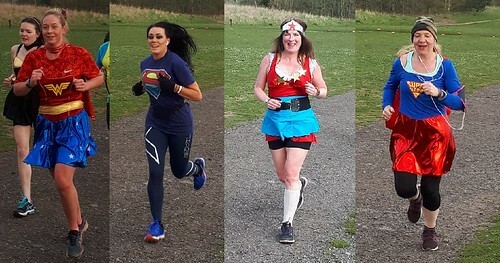 In fact, I was one of the fallers – the first time that I’ve tripped over at a parkrun – and no, before you ask, I didn’t trip over my superhero cape. Anyway, many thanks to all of the lovely people who stopped to help out, especially Fiona Gibson, Michael Payne, Graham Walton, Chris Pattison and Gemma Morris, we really do have a great spirit at Poolsbrook parkrun. Luckily, all seemed to be ok afterwards and we expect to see everyone back again soon. 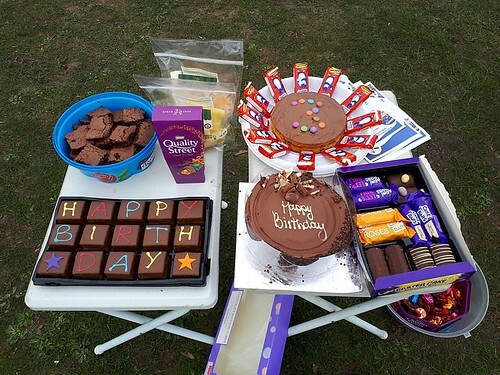 At the finish line we had tempting treats to lure finishers up the finishing path – plenty of cakes and chocolates. Thank you to everyone who brought these in, it really is nice to share a piece of cake with fellow parkrunners on such a special day. Finally – thank you to everyone who took part and to everyone who volunteered, not just this week, but during the 159 events that we have held over 3 years, it wouldn’t be the same without you. May 11th – Clowne RRC takeover which will include pacers ! This week saw 248 of you completing parkrun supported by Mike at the helm and a lovely team of 25 volunteers. We had 5K Your Way, PJ’s, a sing song (well a verse of happy birthday) and a couple of notable milestones. • Gary HESLIP achieved his 50th run, all of these have been at Poolsbrook. Gary celebrated with a well-earned PB. 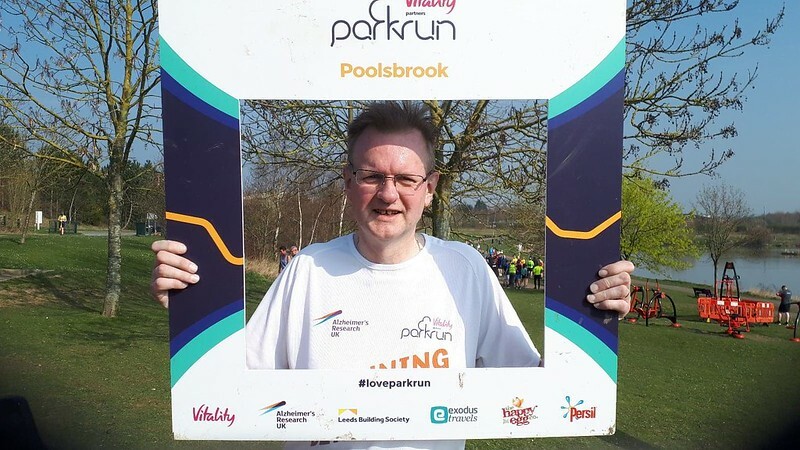 • Richard STEWARDSON achieved his 50th parkrun, 17 of these have been at Poolsbrook. 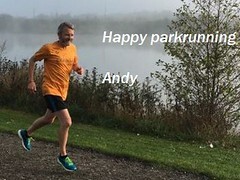 • Andy PORTWOOD achieved an amazing 250 parkruns, and it happened to be his 50th birthday as well. Lovely to have 250 folk singing happy birthday to Andy, oh and the cake was jolly nice too. Thank you Andy. Here’s Gary Heslip, well done Gary. We'll see you and Richard in red shirts very soon we hope. And here’s Andy Portwood, alongside Sam who is sporting a 250 shirt. We look forward to seeing you in green soon Andy. The conditions were ideal for running it seemed, and for a change I joined many of you and did a few laps myself. I have to say I loved to see all the effort folk were putting in and the determination on the ground – you were all working hard and at the same time enjoying yourself. Sam White has been a regular at Poolsbrook, although we haven’t seen him recently. He returned, helped set up the course and then crossed the finished line in a very nifty 18:09 on his 266th parkrun. Great to see you back for a visit Sam. Regarding Barcodes, unfortunately we had 15 folk who did not have their barcodes this week. As you will know we are a barcode only event, you are of course welcome if you don’t have your barcode, but you will not get your time recorded, nor a credit towards the parkrun milestone t-shirt. We are not able to take barcodes off your phone under any circumstances, we need your physical barcode please. Our Ambassadors Wendy Weston, Tina Hensey and Andy Morris, were delighted to greet a few of you and also support you on parkrun today. If you do know anyone who you can encourage to come along, then please share the word. They are of course welcome any Saturday, especially the last Saturday of every month. Lets see this lovely initiative grow and grow. So next week see’s our 3rd birthday (I feel another happy birthday chorus coming along). The way you have all helped this parkrun grow is amazing and you are all superhero’s for making this so. All we are now asking is that you dress accordingly on Saturday and make a party of it. Dig out those superhero costumes and come along and enjoy yourselves. You may have also seen we are going to also make this a pacing event. We have a few volunteers lined up for different speeds, if you fancy running and getting a volunteer credit at the same time then let us know and we can add you to the team. As is fitting we have our very own superhero Mark and his team of volunteers to keep everyone safe and make sure all runs smoothly. Come along, it’s going to be a great morning. I was your RD for this week and it was lovely to great 249 of you and 18 volunteers on what was a lovely spring morning. It was fantastic to see Chris Breen back with us this week. 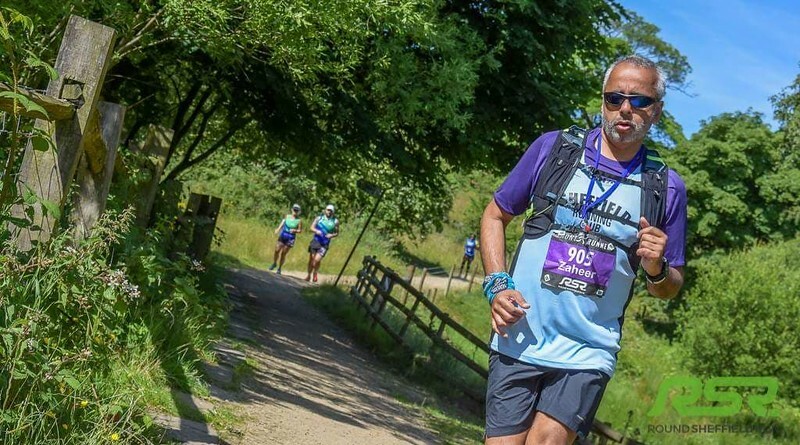 You may not be fully aware but Chris slipped on the way to the start line a couple of weeks ago and was ambulanced off to hospital to find he had badly broken his arm. We are so pleased that he was able to come back and join us and kindly gave his services as a volunteer on the bridge. You will see him helping for a few more weeks until he is hopefully back up and running, but it was a nasty break (we’ve seen the pics) so he won’t be running again just yet. Andy gave the first time runners brief and as you can see there was a fair crowd gathered around him. We are a little low on volunteers over the next few weeks so please consider helping out if you don’t fancy running Please email us at PoolsbrookHelpers@parkrun or via the facebook page if you can help. If you are considering helping but are uncertain about what is involved then have a chat with us, all the roles are straightforward and we will give you full training. Many of our volunteers comment about it being a rewarding experience. • Sam CHARLESWORTH achieved his 10th run in the junior category, all 10 of these have been at Poolsbrook. 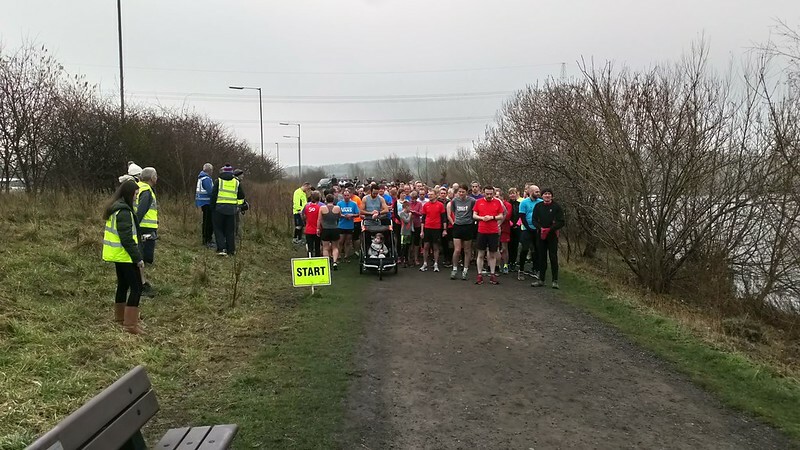 • Ian BROOKES of Clowne RRC achieved his 50th parkrun, 21 of these have been at Poolsbrook. 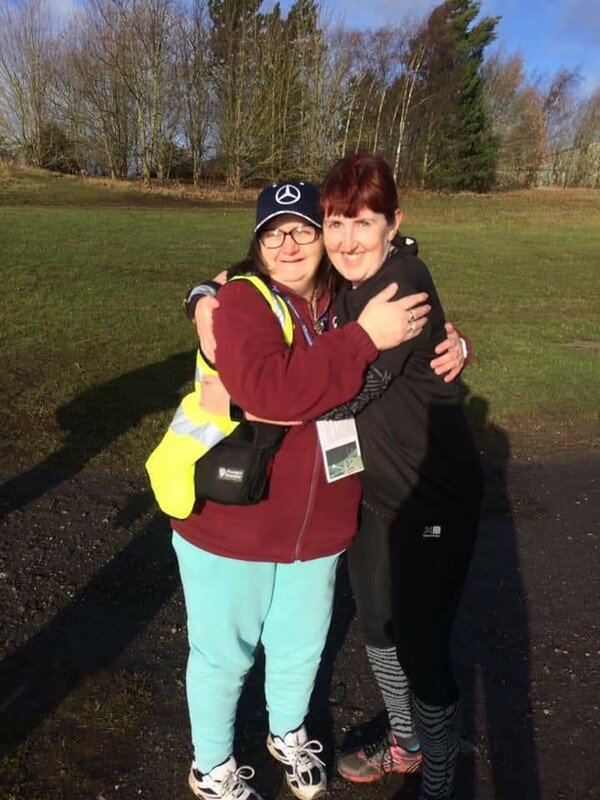 • Lynne JORDAN achieved her 200th parkrun, 99 of these have been at Poolsbrook. Lovely to see we have a few regular in the late 90’s, so we should be celebrating a few more achievements over the next few weeks. Then of course there’s Andy Portwood a regular volunteer and runner here at Poolsbrook (and on the road). Andy will be celebrating his 50th birthday on Saturday and his 250th parkrun. Should be a fun affair. oh yes I nearly forgot … Matt TAYLOR. Regarding Barcodes, we had 4 folk who did not have their barcodes this week. As you will know we are a barcode only event, you are of course welcome if you don’t have your barcode, but you will not get your time recorded, nor a credit towards the parkrun milestone t-shirt. We are not able to take barcodes off your phone under any circumstances, we need your physical barcode please. What we hope to see is on each last Saturday of the month, a group of people who have or have had cancer and have been inactive, joining us at Poolsbrook parkrun for some exercise and some socialising – please give them all a wonderful Poolsbrook parkrun welcome. You can find out more on their Facebook page. 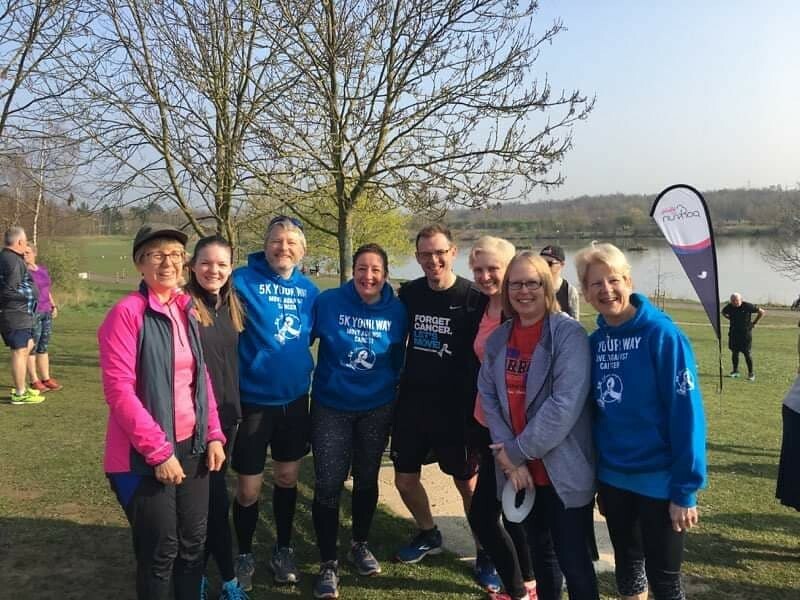 Our Ambassadors will be Wendy Weston, Tina Hensey and Andy Morris – you won’t miss them as they will be wearing their bright blue 5k your way hoodies or T-shirts. Wendy and Andy have presented their personal stories about how cancer has affected them and how parkrun has helped. In January 2018 I came back from a run, I was training for my first marathon when I noticed something wasn’t right. Two weeks later I was given the devastating news that I had breast cancer which had spread into my lymph nodes. Three surgeries, chemotherapy and radiotherapy followed and I am currently on hormone therapy with further surgery planned. During treatment I continued to run when I could, slowing down and reducing distance. The support I got from the Poolsbrook parkrun regulars was amazing. Some weeks I only managed to walk one lap on others I could do a very gentle 5k and I appreciated all the encouragement I got on the way around. I had excellent support from the charity ‘Move against cancer’ and ‘abcd’ (after breast cancer diagnosis) and through their work I came to realise how important exercise is for physical and emotional well-being during and post treatment and for minimising the risk of recurrence. Last week I completed my 50th run and I am looking forward to encouraging runners as part of the 5k your way event. I was diagnosed with Prostate cancer in April 2018, much to my surprise. Surgery followed on 3rd August at the Royal Hallamshire hospital. In the run up to surgery I really ramped up my running to get as fit as possible in the hope that it would help with my recovery – it did ! 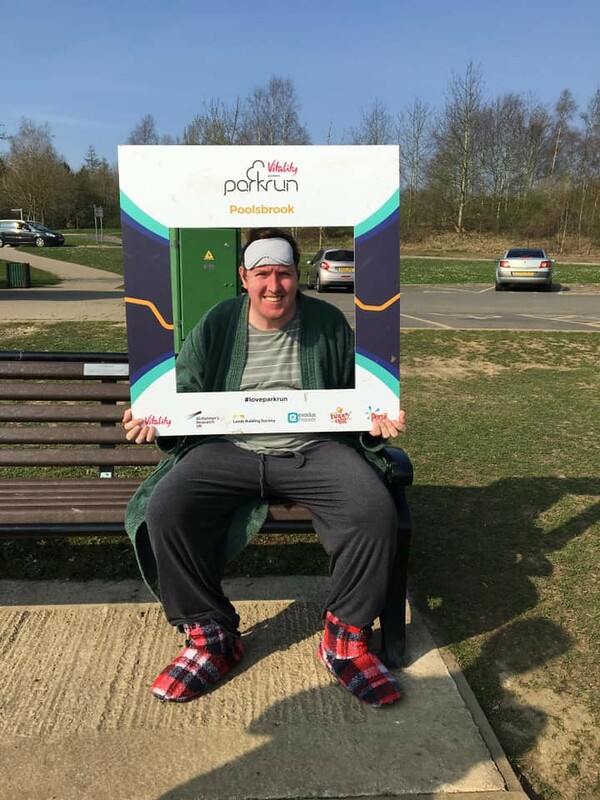 I couldn’t wait to get back to parkrun and my first week back I did token scanning sitting on a chair and watched over by my wife (she thought I’d get up and start dashing around). It’s not only the exercise that helps, it’s also the social aspect of parkrun, talking, drinking coffee, and eating cake. Subsequently I found out that the surgery hadn’t cleared up my cancer so had a course of radiotherapy at the wonderful Weston Park hospital. By this time I was running again and regularly back at Poolsbrook parkrun. Once again I tried to ramp up my running to get my fitness up and sure enough it seems to have helped me get through the treatment. In parallel with radiotherapy I was having hormone therapy and still am – it’s not great but it’s necessary and it should give me a better long term prognosis. My present situation is that I’m still running, enjoying parkrun and waiting for an appointment in August to see my consultant to find out if I’m in remission or need further treatment. I’m now an ambassador for 5k your way and really looking forward to our first event at Poolsbrook parkrun on 30th March. So its looking like an exciting parkrun on Saturday. Mike will be at the helm, come along and enjoy another great event. We’ve laid on some lovely weather and its going to be a party. The following week will also be a big party as we celebrate our 3rd birthday. Come along, but dig out those fancy dress costumes and get yourself dressed up as a super hero, whether you are running or helping lets all make it a fab day. The forecasted rain threatened but never really took hold today and it hadn’t stopped 174 walkers, joggers and runners turning up anyway. The weekly parkrun fix is too great a pull to keep the hardy amongst us away, what would we do at 9AM on a Saturday without it ? Our wonderful volunteers not only turned out to brave the wind and rain, they did it with a smile, a cheer and plenty of good humour – thank you to each and everyone of you, and that means: Andy MORRIS • Andy PORTWOOD • Cherry HAZLEHURST • Chris PATTISON • Ellie CARNELL • Emily BAGSHAW • Gemma MORRIS • Halle WIGNELL-BOOT • Hannah HARESIGN • Jean BAKER • Jess JOEL • Keith HUDSON • Mark HAZLEHURST • Michael JOEL • Neil HOLLINSHEAD • Rhiannon HUMBERSTONE • Simon DEEKS • Teresa PAYNE • Timothy JOEL • Tina HENSEY • William STREET • Zaheer MAHMOOD. Our D of E award ladies were present in a good number again and did a sterling job. Here’s a heads up for everyone – at least one of them will take a turn at being the Run Director soon and I reckon she will be brilliant at it. Can you imagine being a first time parkrunner on a day like today ? To clarify to our first timers – it doesn’t always rain, we don’t always have water jumps, and yes – we are always this cheery ……. So, Andrew LAMING, Ellis LAMING, James COPESTAKE, Joseph CHAPMAN, Lousie WHYSALL, Nicola CHAPMAN, Paul CHAPMAN, Sophie CHAPMAN, Stephanie GROVES, Stephen THORP and Sue MASON, did you have a nice morning ? We all hope so. I guess the same statement applies to our first time visitors too, but I guess that most of them will have experienced all kinds of conditions on the different events that they have visited. Anyway, we always like to welcome our visitors and this week they were Ian Grant RICHARDSON, James MOORE, Jessica DODDS, Jonathan CLARK, Judy PLATEAU, Karen RICHARDSON, Louise Margaret PORTER, Michelle LAMING, Nicola SMITH, Pip HUGHES. It would be great if you gave us another visit in the summer to see how beautiful our park looks with the trees in leaf and the sun shining. I was the Run Director today which is a role that I always enjoy. One of the first things that I did when I arrived was to break the PA system (well I assume it was me !). I guess it’s a good job that I’ve got a loud voice – too loud my family say sometimes. It’s a good job that things improved after that, and even if they hadn’t it wouldn’t have stopped me from having a lovely Poolsbrook parkrun morning. 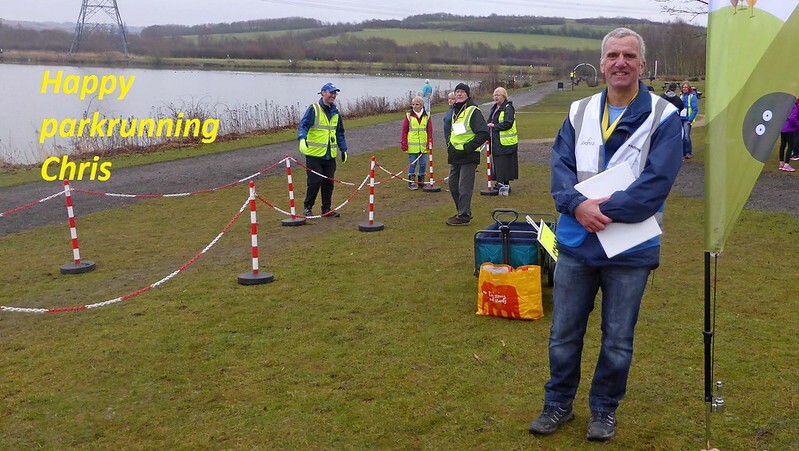 Chris, one of our frequent RDs, was on timekeeper duties today and it turns out that this was the 50th time he’d performed this role (43 times at Poolsbrook) and has volunteered on 123 occasions - thanks Chris, you are a true parkrun stalwart. I was delighted to announce the 50th parkrun (44 at Poolsbrook) for my friend Wendy Weston who as it happens is heading up the Poolsbrook parkrun 5k your way team with additional ambassadors Tina Hensey and Andy Morris (me). Here is a quote directly from their website - ‘A community-based initiative to encourage those living with and beyond cancer, families, friends and those working in cancer services to walk, jog, run, cheer or volunteer at a local 5k Your Way parkrun event on the last Saturday of every month.’ What we hope to see is on each last Saturday of the month, a group of people who have or have had cancer and have been inactive, joining us at Poolsbrook parkrun for some exercise and some socialising – please give them all a wonderful Poolsbrook parkrun welcome. You can find out more on their Facebook page. It wasn’t really a day for PBs, but it seems that some of you still managed one – so congratulations go out to Alex OSBORNE, Alice ROBERTS, Amanda STANLEY, Charlotte BULLAS, David BOWDEN, Donna MARCHETTA, Ellie WOOD, Fiona CRITCHLOW, Heather MORTON, James STOKES, Janet CLARK, Jess JOEL, Keith HIRST, Lee KOSTEWICZ, Louise BEACH, Mark WILCOCKSON, Matt GIBSON, Nerea PAJARES, Nicola ROBINSON, Nigel CALLAHAN, Steven CRANE, Stuart NESBIT, Thomas FOULSTON, Tina BELL. Reminder: If you are taking part with an under 11 years old, please ensure that they stay within arms reach throughout the event. We don’t mind them sprinting off for the last 100m or so, as long as you are able to keep them within reasonable distance. However, we must insist that no children under 11 years old are allowed to either fall behind or race ahead of their parents at any other time. Thank you. 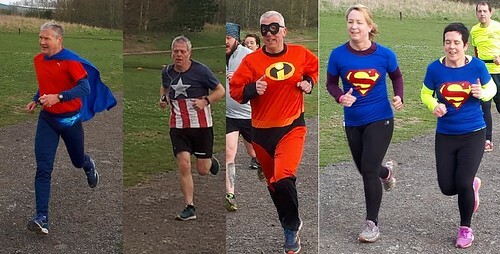 6th April - Poolsbrook parkrun’s 3rd Birthday – our theme will be ‘Superheroes’ so please don your best batman, superwoman, spiderman or other shirt on the day – it should look magnificent. 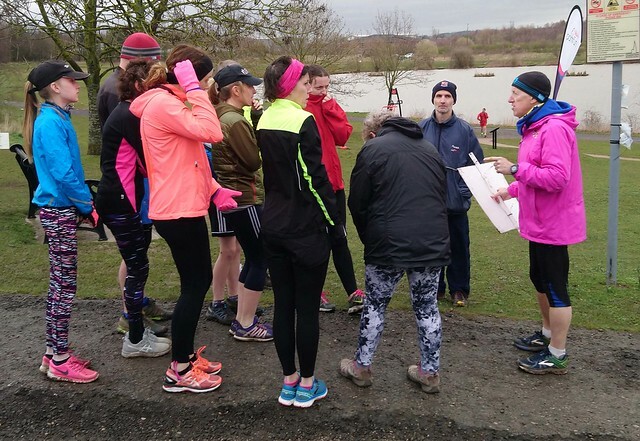 Do you have a story to share with your fellow parkrunners ? If so, e-mail us on poolsbrook@parkrun.com – all we need is a few words and a photograph. It would be great to hear from you. I will be honest and make a confession. As I sat in the car with my husband driving in the pouring rain to Poolsbrook this morning I did smile to myself to see a post on facebook declaring the weather to be ‘lovely and sunny’ at Poolsbrook. 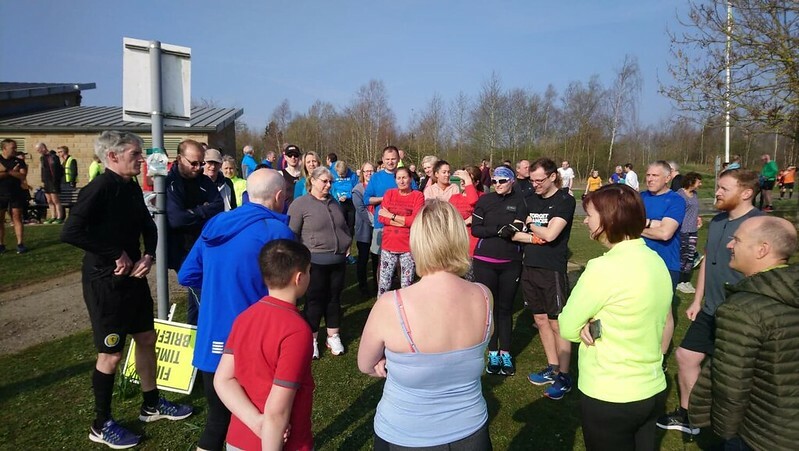 However, they clearly know something about weather in the Poolsbrook team because by 9 o clock the rain stopped and the 161 runners and all our fantastic volunteers all got to enjoy some sunshine for our parkrun this week. Without our volunteers there can be no parkrun, so on behalf of the 161 of us that were able to enjoy Poolsbrook this week, thank you! You also can’t write a run report without a request for volunteers, so please do consider volunteering. The team are really friendly, you will be fully supported, and we know that once people have volunteered once, they come back for more because they genuinely enjoy it. If you want to discuss any roles, or how you can help out, feel free to speak to the run director, or the team on the day, send an email to poolsbrookhelpers@parkrun.com or sign up to receive the regular emails by changing your parkrun settings. One of the great things about Poolsbrook is the community atmosphere. Perhaps this is because you go round the lake 3 times, so you never feel like you are running on your own, and there’s always encouragement from fellow parkrunners and some of the most encouraging marshalls of any parkrun my family have been to. 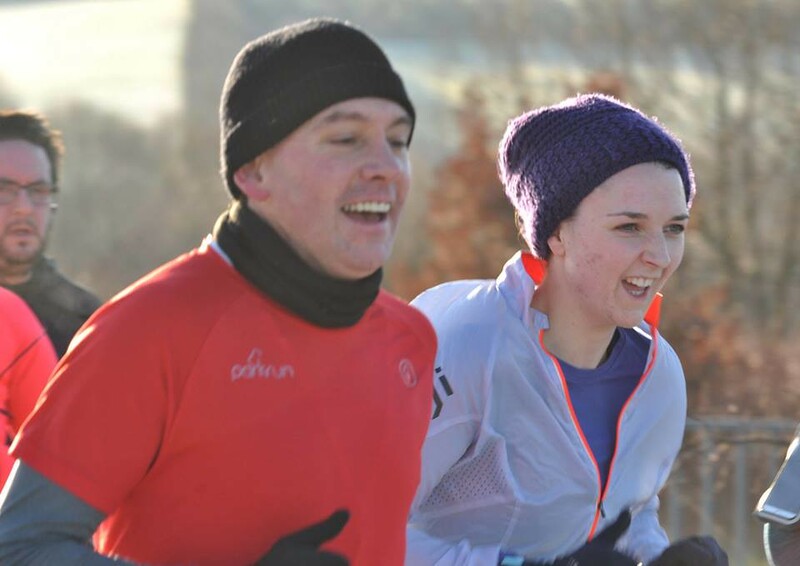 We welcomed two of you to our parkrun family who are completely new to parkrun: Paul JAFFRAY and Rhiannon HUMBERSTONE, we hope that you enjoyed it, and we look forward to you completing many milestones in the future. Chris PAYNE one of our regular parkrunners achieved a brilliant PB today of 54:59 see the photo below. Well done Chris! Do you have any milestones coming up ? If so, try to let us know in advance so that we can give you a name check on the day. Also, if you have any stories to share about your parkrun experience then we would love to hear them. Either come and have a chat with me or one of the Run Directors or e-mail us at poolsbrook@parkrun.com. Sadly, one of our parkrunners Chris fell near the before the start and hurt his arm quite badly. We are thinking of you Chris and wish you a speedy recovery and look forward to seeing you again in the near future. So one last well done to everybody. Here’s to the speedies, the joggers, the ‘I can’t believe I’m here againers’, to the volunteers and the supporters, to the smilers and the cheerers. What fun we had, and we look forward to doing it all over again next weekend. 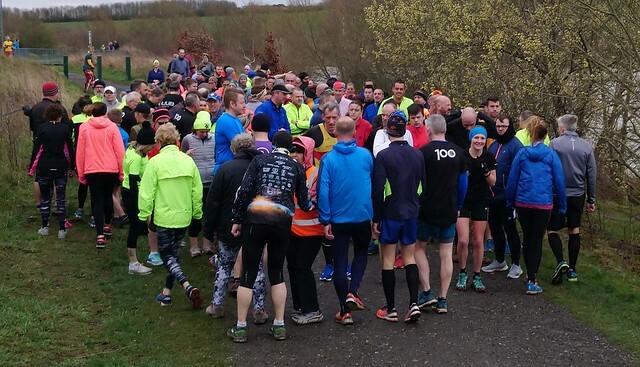 Did you have a great time at Poolsbrook parkrun on Saturday ? There certainly seemed to be loads of happy faces despite the effort that you were all putting in. 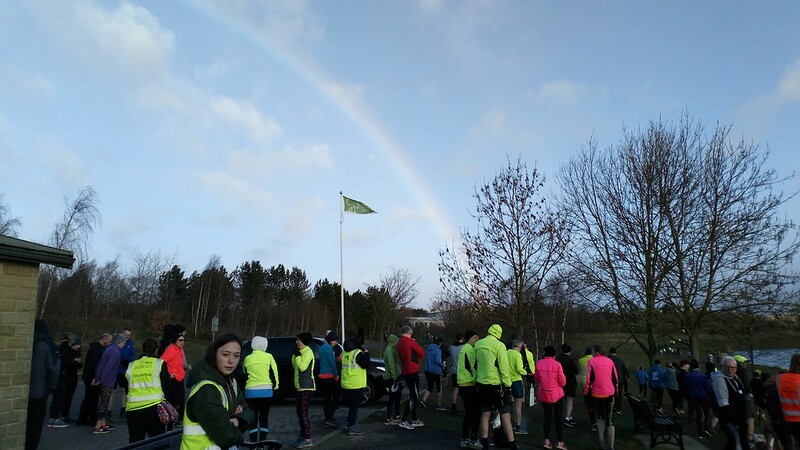 We were rewarded with a bit of unexpected sunshine which lit up our beautiful location and showed it to it’s best to the 29 first time parkrun tourists. So – did: Andrew TAYLOR, Andy CULLEN, Angela HANSON, Caroline HORTON, Carrie SHAW, Chris GRANGER, Christopher HINDLEY, Danny WEARIN, David HORTON, Dawn LITCHFIELD, Evan CULLEN, Janet CLARK, Joe GARDNER, Julia HINDLEY, Julie CROWLE, Karen BAKER, Kevin DUNNE, Marianne BURFORD, Matthew HALLBROOK, Paddy WILKINSON, Rob TEARLE, Roy PHOENIX, Samantha TEARLE, Sophie CULLEN, Stacey ROSE, Stephen WICKS, Steve MALLINDER, Tina BELL, Yvonne MILLS enjoy our beautiful parkrun ? Answers on a postcard, or perhaps just as a comment ! Rog ‘the stopwatch’ Street certainly had his fair share of first timers at his new runners briefing. It was one of the biggest crowds I’ve seen outside our festive celebrations. Rog was delighted to welcome 5 people doing their first (of many we hope) parkrun. Welcome to Dianne NORTON, Heather MORTON, Jacob SKINNER, Layla DAVIES, Margaret WICKS, see you next Saturday. Our volunteers are great aren’t they ? We frequently receive kind comments from visitors telling us how well run our event is and how cheery our volunteers are – this is always really nice to hear. Whatever the weather, our volunteers always manage to keep a smile on their faces and have a nice word to say to participants. I would suggest that one reason why they are always cheery is because they enjoy volunteering, it’s such a rewarding experience. If you want the chance to get your volunteer smile then leave us a message on our Facebook page or you could send us an e-mail to poolsbrook@parkrun.com. You can see which roles are still vacant for coming weeks by looking at our future roster. 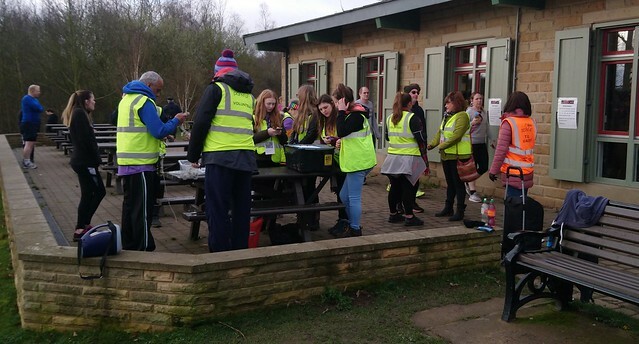 This week we had a fantastic turnout of Duke of Edinburgh award volunteers taking part – they have become a regular fixture at Poolsbrook parkrun and we certainly hope that they stick with us once they have attained their awards. Thank you ladies, you were wonderful. One of our regular volunteers – Tina Hensey volunteered for the 25th time on Saturday when she did token sorting in the café after the event. Tina now qualifies for the lovely purple 25 volunteer shirt. 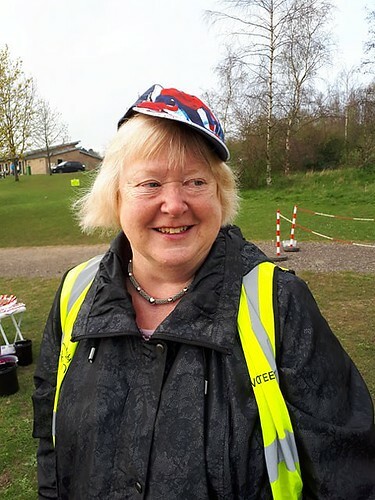 Thanks for all you have done for Poolsbrook parkrun Tina. We all know about Roger’s corner, where the effusive Roger Kench belts out his greetings and ‘hello Tiger’ high fives to the younger participants. 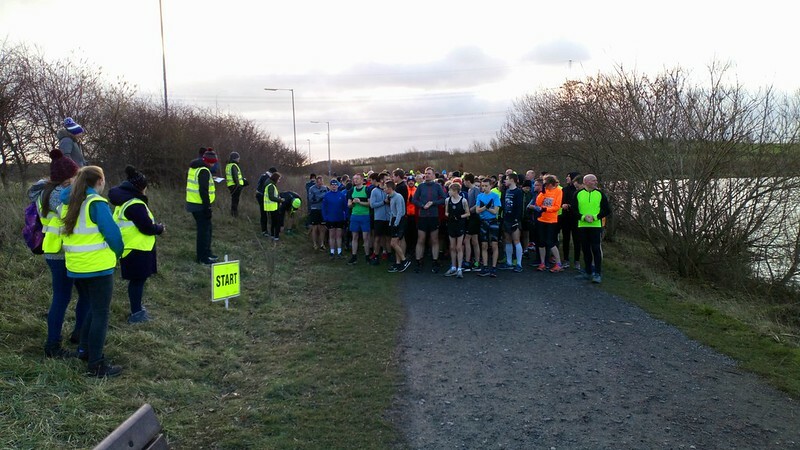 Well we’ve now had a suggestion about another prominent landmark at Poolsbrook parkrun – namely Teresa’s ‘T’ or Teresa’s T-junction. Teresa Payne has stood and cheered and encouraged us all at the T junction where final lappers peel off the main route and onto the finish path. I think it sounds great – how about you ? Teresa is also the Poolsbrook hugger, if she hasn’t hugged you yet, then she will – thanks Teresa. 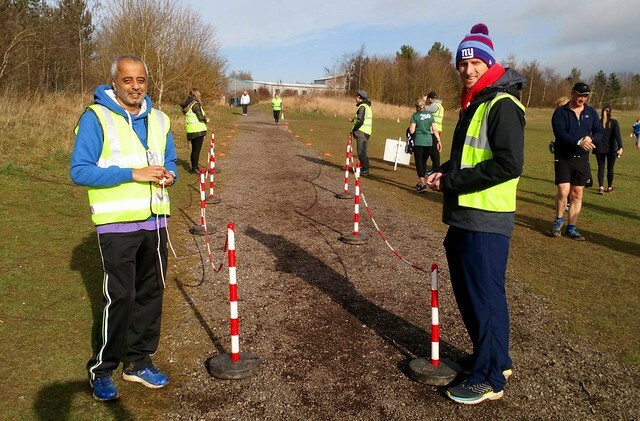 50th parkrun – Ian Wilson (40 at Poolsbrook) and Jonathan Heathfield (49 at Poolsbrook). Let’s hope that we see those lovely red 50 shirts soon. Did you achieve a personal best (PB) time on Saturday ? I didn’t, but to be fair – I was Run Directing so it would have been a miracle if I had ! It appears that lots of you made the best of the good running conditions to set your personal best time at Poolsbrook parkrun. I think that’s worthy of a shout out, so let’s all congratulate Alicia LOCKETT, Russell CUNLIFFE, Donna MARCHETTA, Emily SWIFT, Hannah RODEN, Julian SKINNER, Rachel TAYLOR, Diana BOOTH, Chris CAINE, Saul BLAND, Alexandra DECK, Sean RODGER, Laura CATHERWOOD, Matt GILLWAY, Simon FROGGATT, Stuart NESBIT, Kim KNIGHT, Emma HAZEL, Molly FLANAGAN, Charlotte BULLAS, Alice ROBERTS, Fiona CRITCHLOW, Liz CLOSE, Neil YEWMAN, Erin POINEY, Sharon BASSETT, Niki GLOVER, Simon HARRISON, Matthew PRIOR, Lynn THOMPSON, Gareth HARDWICK, Fritz STEINHOBEL, Simon TOMLINSON, Jess JOEL, Keith GREEN, Malachi BAKER-HUNT, Ian EDMUNDSON, Peter MOXON, Andrew WATLING, Ian WILSON, Daniel STANLEY, Oskar WOODS, Louis CLARK, Dean HAGUE, Claire BRACEGIRDLE, Travis SENIOR, Nigel SAUL, Leah Grace GREGORY, Kevin DALE, Helen DOYLE, Kevin DOYLE. Roy Phoenix achieved an age graded record of 56.02% for the VM80-84 category in his first ever run at Poolsbrook parkrun. 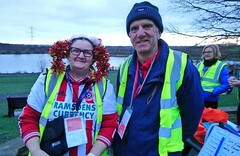 Roy generally runs at Hillsborough parkrun and was a very welcome tourist on Saturday. One thing to note on Saturday was the exceptionally high number of finishers who did not have their personal barcode and therefore had to be recorded as unknown in the results. I’m not really sure why this should be so high – any ideas ? 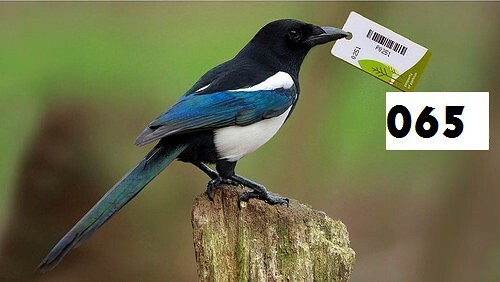 Please, whatever you do – don’t forget your barcode ! You can print a replacement barcode by visiting your personal record. An alternative method would be to follow this link. Or, you could purchase one of the more permanent personal barcodes in the form of a plastic tag or a wristband – more details here. If you are interested in finding out more about parkrun you can either visit the parkrun UK website or follow the regular parkrun blog. So, do any of you have any milestones coming up ? If so, try to let us know in advance so that we can give you a name check on the day. Also, if you have any stories to share about your parkrun experience then we would love to hear them. Either come and have a chat with me or one of the Run Directors or e-mail us at poolsbrook@parkrun.com. Enjoy the rest of your week, and I’ll see you all again on Saturday when we do it all again ! I took to the helms today, on what was an unusually cold morning (we had spring-like weather for the past few days). The roster was looking particularly thin only two days ago, but we had an overwhelming response to the facebook call which is no small testament to the wonderful volunteers who stepped in at short notice. We could always do with volunteers in future weeks though, so If you are not running for whatever reason, or just fancy having a look at behind the scenes, how we make things happen in the background, why not give it a go? Just leave us a message on our Facebook page or e-mail us on poolsbrookhelpers@parkrun.com . Alex BREWSTER, Rachel NEWBOLD, Rachel TAYLOR, Mary-Jane MUSSON. It was Rich PENNEY’s 50th run today, one in which he also achieved a PB! Congratulations on the PB, and of course the 50th. We look forward to seeing you in your milestone T shirt soon! Today was also the day I turned another year older, and it was very nice to get a round of applause during the run briefing. Needless to say there was cake for the occasion - but in typical fashion I forgot to bring along a knife to cut it! Luckily, Poolsbrook regular Gordon came to the rescue - he just happened to have one on standby! The cake proved to be so popular that it was finished before the Tail Walker crossed the line! Thanks also to the many of you for the good wishes! To coin a phrase, it really put the icing on the cake to an already great morning. Lovely to see Tina at parkrun today with her grandson Deacon aged 7. It was Deacon's first parkrun and he was clearly a happy chap. Here's a lovely pic of Deacon with Tina enjoying the day, its great that parkrun can span the generations. Next week it’s Chris Turner wearing the RD jacket in what promises to be yet another great parkrun day. Have a great week everyone and see you next week! 257 of you (and 21 hardy volunteers) enjoyed what turned out to be a fairly mild and pleasant morning, especially for February. • Matthew WOOD of Chesterfield & District AC achieved his 10th run in the junior category, 9 of these have been at Poolsbrook. 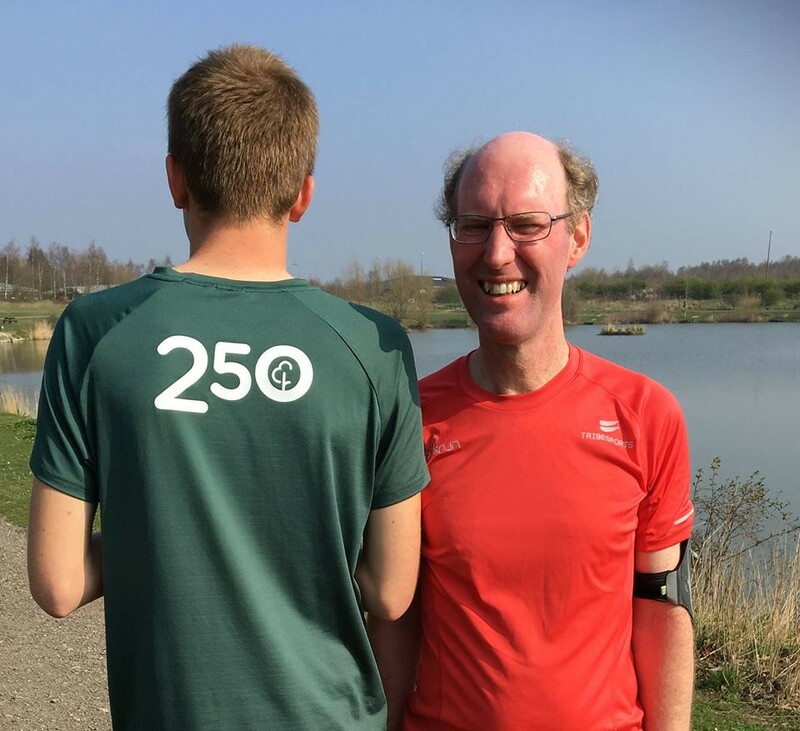 • Phil HUGHES-NARBOROUGH of North Derbyshire RC achieved his 250th parkrun. Phil is a well travelled parkrunner, this is his 9th time here. Well done Phil, we don’t get too many 250’s. A massive welcome to everyone that was here for the first time, we hope you enjoyed yourselves and would love to see you back here. Tourists please spread the word about what a lovely parkrun we have here. First timers, we hope to see you back over the coming weeks. Those New Year resolutions continue to go well, the attendance to Poolsbrook remains very strong this year, and we haven’t dipped below 200. Its fab to seen so many of you out enjoying yourselves on a Saturday morning. It was a fast one today, Mark Kurt JOHNSON of Leicester Coritanian AC set himself a new PB and ran the 4th fastest time we have seen at Poolsbrook. We were treated to see 8 runners finish in under 19 minutes – wow. Next week promises to be another great parkrun when Zaheer will take the helm. Come along, we’ve laid on yet another a mild sunny morning, its going to be great. 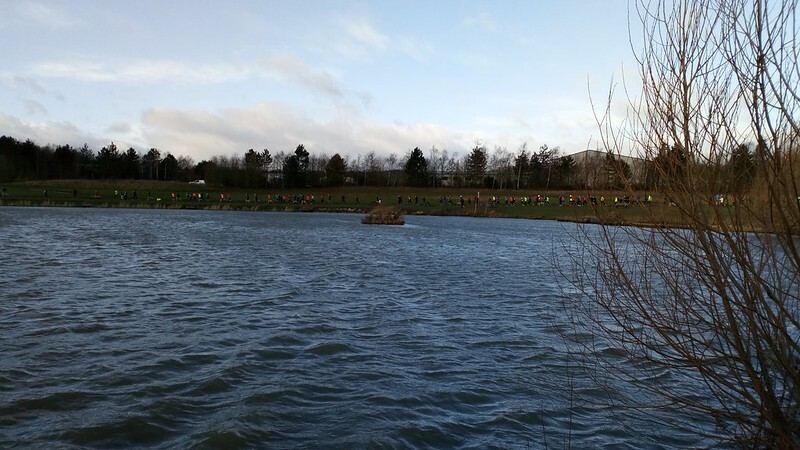 226 of you (and 26 hardy volunteers) braved storm Erik and it was clearly Poolsbrook parkrun 1 – Erik 0. Well done everyone on some great performances on Saturday, in spite of some pretty strong gusts (45mph according to the BBC). A few local parkruns had to cancel so we were thankful that we felt it was safe, although a little challenging of course. 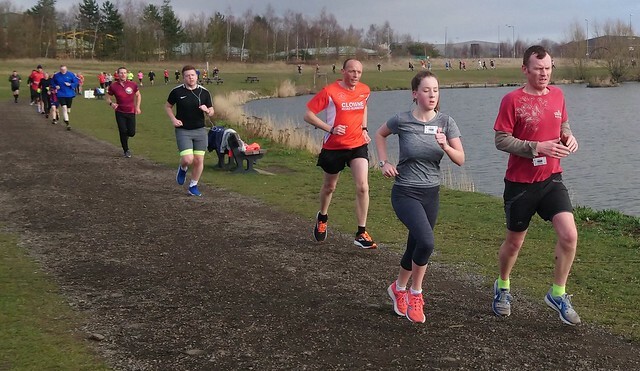 • Hannah SHARPE of Clowne RRC achieved her 50th parkrun, 28 of them being at Poolsbrook and got a PB to boot. 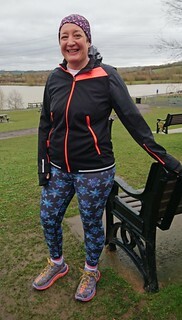 • Angela BARNSTON of North Derbyshire RC achieved her 50th parkrun, 35 of them being at Poolsbrook. • Oskar WOODS of Worksop Harriers & AC achieved his 50th parkrun, 15 of them being at Poolsbrook. Worth noting that Oskar has achieved this at 9 years of age. Regarding Barcodes, we had 6 folk who did not have their barcodes this week. As you will know we are a barcode only event, you are of course welcome if you don’t have your barcode, but you will not get your time recorded, nor a credit towards the parkrun milestone t-shirt. We are not able to take barcodes off your phone under any circumstances, we need your physical barcode please. It looks like folk are doing well with the New Year resolutions. The attendance to Poolsbrook is looking good this year, and we haven’t dipped below 200 I’m chuffed to say. That’s testimony to what a wonderful parkrun we have and all of your efforts, its great to see you coming back week after week. Did anyone notice that the youngsters stole the day today, with 3 juniors in the top 5 – wow. Lovely to see Joshua WRAGG of Rotherham Harriers & AC cross the line in 17:52. Well done Joshua. Next week promises to be another great parkrun when Roger breaker of watches will have the helm. Come along, we’ve laid on a mild sunny morning, its going to be great.